Enjoying my favourite moon cake with Wuyi Shuixian tea with lanterns all around me. Chinatown’s shop displays are full of Mid-Autumn Festival moon cakes right now (the Festival falls on 22 September this year, the 15th day of the 8th Lunar calendar month) and I’m reminded of the stories and fables associated with this time of year. Chinese children learn about the story of Chang E (长娥). Around 2000BC ten scorching suns filled the sky, causing droughts across the land. A brave archer called Hou Yi (后羿) climbed Kun Lun mountain (昆仑山) and shot down 9 of the suns, giving strict orders for the times of rising and setting of the remaining sun. Hou Yi was hailed as a hero after this magnificent feat. He married the beautiful Chang E and then went to the mountains to pursue Dao and experiment with elixirs of life. One day, some rogue disciples waited for Hou Yi to go off gathering herbs in the mountains, then burst in and demanded that Chang E surrender the elixirs. Chang E refused and instead swallowed all the elixir pills herself. She grew lighter and lighter and gradually floated to the moon and became a moon fairy! The heartbroken Hou Yi set up an altar and laid out Chang E’s favourite fruits on the full moon night and this was quickly replicated. Thus, even now, it is customary for single females to lay out a feast to offer to Chang E at the Mid-Autumn Festival in the hope of acquiring her beauty! Answer 3 simple riddles to win a place on the popular tea appreciation master class on 10 October worth £35! Riddles will be announced at 10.30am from Monday to Wednesday next week via Twitter, Facebook or on teanamu online tea-store website. Closing date is Thursday 30 September 2010! 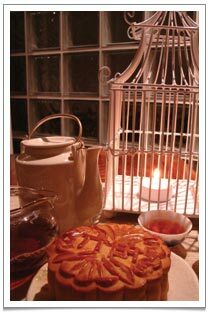 The second story is directly related to the creation of moon cakes. Under the oppressive Yuan dynasty (1271年－1368年) General Zhu Yuan Zhang (朱元璋) wanted to rebel and his adviser Liu Bo Wen (刘伯温) thought of an ingenious idea. He instructed bakers to insert into a Chinese pastry a piece of paper on which was written “rebel on the night of the 15th of the 8th month” (八月十五夜起义). The rebellion was a success and General Zhu decreed that the pastry be named “moon cake”, to be enjoyed at Mid-Autumn festival. Moon cakes were typically round in shape reflecting the circular full moon and symbolising the reunion of loved ones. Ever since the Tang dynasty, people have loved sitting under the Mid-Autumn full moon tasting moon cakes, dried fruits and nuts while drinking strong, highly oxidised oolong tea like traditional Tie Guan Yin or Iron Luo Han, in gardens decorated with beautiful lanterns. For fun scholars would write riddles on these lanterns, and in keeping with this Mid-Autumn Festival tradition, teanamu is offering a prize of a place on the popular Tea Appreciation Master Class on 10 October worth £35 for a lucky tea lover who can answer 3 simple riddles! Riddles will be announced at 10.30am from Monday to Wednesday next week via Twitter, Facebook or on teanamu online tea-store. My childhood memories of the Mid-Autumn Festival revolve around salted duck egg yolks and red mung bean paste moon cakes. A rare treat was a whole moon cake with 4 yolks! I usually only got to eat a moon cake with 2 egg yolks. What I like about these sweet sticky pastries is the saltiness of the duck yolks and the slightly caramelised sweet red bean paste. As a child, I used to seek out the little melon seed kernel treasures hidden in the bean paste with their crunchy texture. The paper thin pastry also adds a hint of caramelised bitterness though its main job is simply to hold everything together. 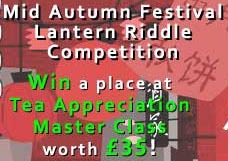 A little riddle on lantern. 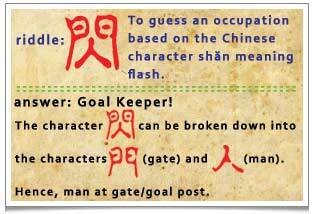 A play on the pictorial nature of Chinese characters. As my taste became more adult, I learned to enjoy moon cakes filled with lotus bean paste or candied winter melon with lots of seeds called Wu Ren (五仁) or date paste. I have also tried new variety moon cakes that are made with a cooked pastry skin called “ice-skin”, moon cakes made with different kinds of tea (in the filling or in the pastry skins), exotic moon cake flavours like durian and even bamboo charcoal ice-cream moon cakes. In Taiwan people also like to eat a pineapple paste encased in a short crust pastry. In terms of matching teas with moon cakes, I think that for the super sweet moon cakes like plain red bean, dates or pineapple paste, delicate and sweet green teas like Dragon Well and Taiping Houkui and the lightly oxidised oolongs like Lishan oolong or Dong Ding oolong are the most suitable. These teas would tone down the sweet cake fillings. Moon cakes are yang in nature and works well with the yin green teas. The floral notes in these greens and light oolongs add a wonderful backdrop to the sweetness of the cakes. Slightly oily moon cakes, those with the Wu Ren and lotus seed paste or salty duck egg yolks and red bean paste, go well with green or ripened Pu Erhs depending on your body type. A green Pu-Erh like our Big Snow Mountain 2010 Spring Harvest is yin while a ripened 1998 Vintage Emperor Pu-Erh is yang. 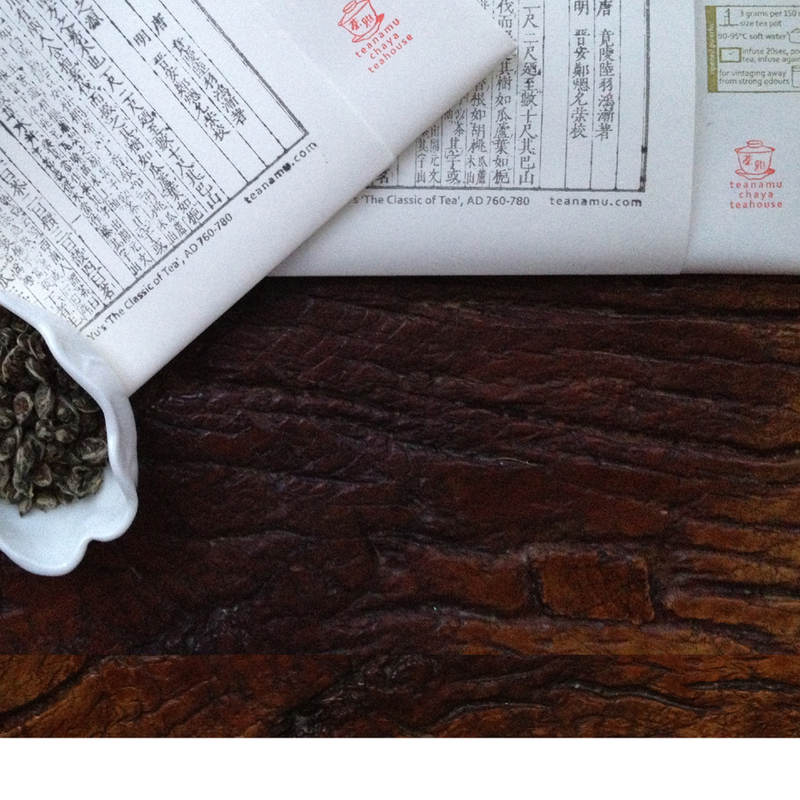 One can even add chrysanthemum flowers to the Pu-Erh teas. These teas will help to calm down the heatiness of oily moon cakes. As for the salty-sweet moon cakes like those with green bean paste fillings, you might want to consider highly oxidised oolong teas like the chocolaty and malty Wuyi Shuixian. A floral black tea like Rose Congou can help cut through the sweetness and the saltiness. You might even want to consider adding a slightly tangy salted plum to the tea! My favourite Moon Cake has just the plain sweet Lotus seed paste … such a delight to read this blog of yours, whisking me back many years to my childhood.